Learn more about ocean conservation on Sea Web. Here’s their 2012 Super Bowl ad. 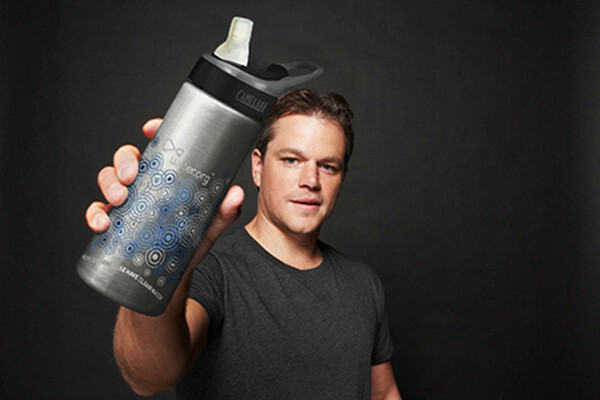 Would you consider making a donation to Charity: Water this Earth Day? You might be thinking, “oh no! Not another brand of bottled water!” Or even “aren’t landfills full of plastic bottles as it is?” I know I did. Sure, there are plenty of recyclable water bottles around. But have you ever heard of a water bottle that is both recyclable AND biodegradable? 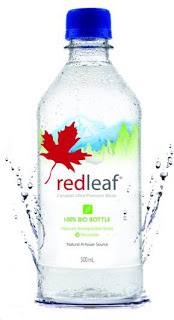 Enter redleaf Water, Canada’s Ultra-Premium bottled water. What makes redleaf Water’s bottle different? “redleaf’s BIO BOTTLES produced by Arizona-based environmental solution provider ENSO Plastics, will biodegrade naturally in aerobic and anaerobic (landfill) conditions and are #1 PET, allowing the bottles to be recycled without requiring any special handling. So kudos, redleaf Water. Keep taking those baby steps towards a sustainable water bottle. 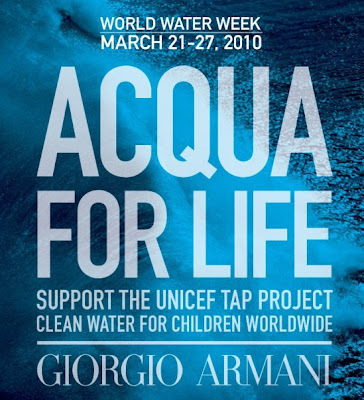 Mark your calendar, greenies, World Water Day‘s right around the corner, specifically on March 22, 2010. This effort came about thanks to the 1992 United Nations Conference on Environment and Development (UNCED) in Rio de Janeiro. As former United Nations Secretary-General Kofi Annan wrote, “(w)ater is essential to life.” We need potable water to survive. We need it to stay clean. We use it for cooking. Even our industries are heavily dependent on water. Heck, the entire planet is mostly water. 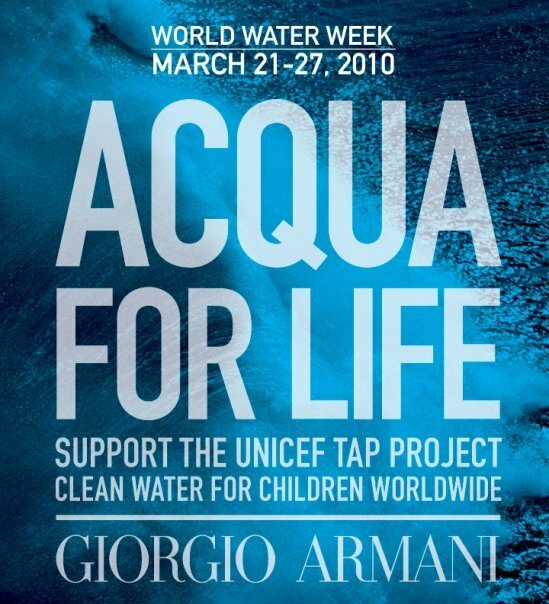 So go out there and join the events on World Water Day. You can even organize your own event, if you want. If you have a water meter, check your home for hidden leaks. Take a reading, don’t use the water for several hours, then check the meter again. If your new reading is higher, you’ve got a leak somewhere. Leaky faucets could be the cause so fix any you find. A faucet dripping just once per second will waste an incredible 2,700 gallons per year. Most faucets have aerators that mix air into tap water to reduce usage. If you don’t have one of these inexpensive screw-on attachments, buy one at the hardware store. Retrofit your bathroom: Install low-flow showerheads and if your toilet is a water guzzler, replace it. Older toilets waste as much as 14,000 gallons per year vs. new water-saving models. If a new toilet is not an option, “convert” your commode to a water-saver by sealing a plastic jug of water or two and placing it in your toilet tank to displace some of the water there. Showers use less water than baths. Limit the showers in your home to five minutes each and you’ll save even more! Don’t run your faucet while you shave or brush your teeth. Teach your kids the same conservation ethic. Stop using your sink’s garbage disposal. It needs a lot of water to work and wastes perfectly good compost! Rather than run your tap waiting for drinking water to get cold, keep a pitcher in your fridge. Similarly, install an instant hot water tap on your kitchen sink. When it’s time to do laundry, make sure your washing machine is full. If it’s a lightly soiled load, use the shortest wash cycle. Try to use bath towels more than once before washing them. Consider buying an energy-efficient front-loading washing machine. In the yard, cut your grass high in order to keep soil moist and promote deeper roots that will need less watering. Aerate your lawn by poking deep, nail-sized holes in it at roughly six-inch intervals. This will help water soak into the soil rather than run off the surface. Put an empty baking pan in your yard and measure rainfall. If you’re getting at least an inch of rain per week and the weather isn’t scorching, you probably don’t need to water your lawn. If you do, water in the early morning before the day heats up to prevent wasteful evaporation, and make sure your sprinkler is hitting only lawn and not sidewalks or driveways. Use a rain barrel to collect gutter water for garden and houseplant use. Practice xeriscaping, the art of landscaping with regionally indigenous plants that don’t need a lot of water. Use mulch wherever possible to help soils retain moisture and reduce the need for waterings.